Photo: Adolph H. Kayser House, ca. 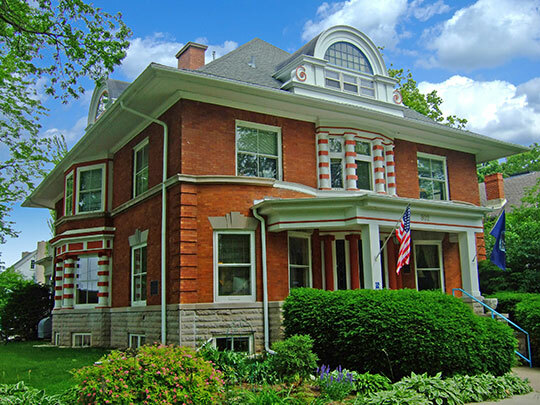 1902, 802 E. Gorham Street, Madison, WI. Listed on the National Register of Historic Places in 1980. Photographed by user:James Steakley (own work), 2009, [cc-by-3.0 (creativecommons.org/licenses/by/3.0)], via Wikimedia Commons, accessed August, 2013. Dane County Courthouse is located at 210 Martin Luther King Boulevard, Madison WI 53703; phone 608-266-4121. Dane county, so named in honor of Nathan Dane, of Massachusetts, who drafted the celebrated ordinance of 1787 for the government of the Northwestern Territory, is situated midway between Lake Michigan and the Mississippi river; its southern boundary being twenty-four miles north of the south line of the state. It is bounded on the north by Columbia and Sauk counties, on the east by Dodge and Jefferson, on the south by Rock and Green, and on the west and northwest by Iowa and the Wisconsin river. Its extent is forty-two miles from east to west and thirty-five miles from north to south, containing one thousand two hundred and thirty-five miles, or 709,400 acres of land. The county was organized into a separate government in 1839, when it contained about 300 inhabitants. The United States' census, taken in 1870, makes the number 53,109, being a gain, since 1860, of 9,187. There are thirty-nine towns in the county. Six of them are largely settled by Norwegians and six by Germans, and the American and European nationalities are more or less represented in all of the towns. The county is well watered by lakes and streams, and the soil is generally fertile; in some parts extensive prairies prevailing, and in others undulating and hilly land. Timber is plentifully interspersed throughout the county. The public land in the county is all taken up and the unimproved land remaining can only be obtained from speculators and others. There are churches of all denominations throughout the county, also public and private schools. The Milwaukee and St. Paul railroad runs through it westwardly; the Chicago and Northwestern runs through it going northwest, the Milwaukee and Watertown runs west as far as Madison, where it connects with the main Milwaukee and St. Paul line, and the Portage and Madison road runs south as far as Madison, and efforts are being made to extend the same southwestwardly so as to reach the coal beds of Illinois. Is bounded on the north by Sauk and Portage counties; on the east by Dodge and Jefferson; on the south by Rock and Green; and on the west by Iowa; or on the north by the north line of township nine; east by the east line of range twelve; south by the south line of township five; and west by the west line of range six. It is forty-two miles long, from east to west, and thirty miles wide from north to south, with an area of twelve hundred and thirty-five square miles, or sections, thirty-five of which are covered by the water of the lakes. This county was set off from the west part of Milwaukee, and east part of Iowa counties, in 1836, but was not organized as a separate county until 1839. Its population, in 1838, was one hundred and seventy-two; in 1840, it was three hundred and fourteen; and at the last enumeration, in 1842, its population was seven hundred and seventy-six. It may now be estimated at about four thousand five hundred. The county seat is at Madison, the capital of the Territory. The face of the country, in this large and important central county, is much diversified by hills and valleys; the hills, however, are always of moderate elevation, and have gentle slopes to their summits. The valley occupied by the Four Lakes, and their outlet, is the principal one, and occupies the central portions of the county. There are no considerable portions that can be called timber land, it being almost entirely oak openings or prairie. Some of the eastern portions of the county are occupied by dry ridges, separated by wet meadows, and afford but little inducement for present settlement. The west line of the county passes between the two Blue Mounds, the largest, or principal one, falling within the county of Dane. About three townships, occupying the southwest corner of the county, are within the county known as the " Mineral region," and lead mines have long been worked at the Blue Mound. It touches upon Lake Koshkonong, an expansion of Rock river on the southeast, and upon the Wisconsin river at the northwest, embracing the ground upon which the " battle of the Wisconsin" was fought, between the volunteers under General Henry Dodge, and the Indians under Black Hawk, July 21, 1832. There are three newspapers published in this county, at Madison : and six post-offices have been established—at Madison, Moundville, Cottage Grove, Fitchburg, Dane, and Sun Prairie. Lapham, I. A., Wisconsin: Its Geography and Topography, History, Geology, and Mineralogy, 1846, S. W. Bennett, New York.